The 3-manual, eleven rank Möller Deluxe Theatre Pipe Organ, also known as the Frank Sheffield Memorial Organ, is Opus 5351 of the Möller Organ Company, formerly of Hagerstown, Maryland. 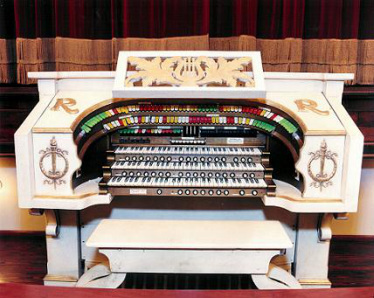 The organ was originally installed in the Riviera Theatre in Scranton, Pa. It later found a home in Atlanta's East Point Theatre where the installation was never completed. Mr. James Thrower, of Marietta, Ga., purchased the organ and donated it to the Rylander Theatre. Thanks to the generous gift of Anne Bradley Hale, the organ has been restored by the A. E. Schlueter Pipe Organ Company. Mrs. Hale's father, Frank Sheffield, of Americus, once served as house organist at the Rylander Theatre and was an organist and organ enthusiast throughout his lifetime. The Rylander Theatre originally opened on January 21, 1921. In 1951 the theatre closed its doors -- not to be re-opened until 1999. In spite of years of neglect and deterioration, the Rylander has been exquisitely restored to its original splendor. The facility re-opened September 1, 1999 after almost four million dollars of restoration. The restoration was launched in 1994 by the city of Americus when the Mayor and City Council agreed to buy the theatre and allocate one and a half million dollars toward its restoration. A 1994 Floor Recovery Grant funded the roof repair and Georgia Governor at the time, Roy Barnes, allocated $450,000 toward the restoration. Additional funds were raised through other state grants and private donations. The Rylander Theatre is among 22 winners statewide honored by the Georgia Trust for Historic Preservation, which awarded the theatre the Preservation Award of the year 2000. The Rylander Theatre was also cited for excellence in restoration during the Georgia Trust's annual meeting in Columbus, Ga. on April 1, 2000. The organ was dedicated by organist Mr. Ron Rhode, of Phoenix, Arizona, on October 30, 1999. Present in the audience were President and Mrs. Jimmy Carter, Mrs. Anne Bradley Hale, Mr. James Thrower, members of the Atlanta Chapter of the American Theatre Organ Society, and staff of the A. E. Schlueter Pipe Organ Company.